We have handpicked a list of 20 Gmail plugins that will up your Gmail game and make you a better professional. Read on to find our list! Email has always been a central part of any business’s communication. The first email was sent in 1971, about 47 years ago! It has definitely stood the test of time and shows no signs of slowing down. People still like sending and receiving emails. Professionals, especially marketers, like sending emails as more than 80% of B2B and B2C companies are still using email marketing technologies as part of their marketing strategies. And the consumers don’t mind at all, as a large majority of U.S. adults, 72% prefer communicating with companies through email. EMAIL AND PRODUCTIVITY ARE A TOUGH MATCH! No matter how awesome emails are and how much it helps your marketing efforts to bring in revenue to your company, running a business is more than just emailing a bunch of people. Marketing in this digital era is all about speed and productivity. You have to delegate every minute of your time and make sure you are on top of your game 24×7. You can’t just spend your day in your inbox, trying to make sense of the plethora of emails and deleting spam messages. Spam accounts for 14.5 billion messages globally per day. In other words, spam makes up 45% of all emails. With your inboxes filled with so many unwanted messages, critical information is bound to get overshadowed. The average office worker gets 121 emails per day and spends as much as 6.3 hours each day checking their personal and business messages. If you are spending more than half of your time checking emails, your work is certainly going to suffer. If you use email a lot, there’s a good chance that your primary email client is Gmail. With over 20% market share, Gmail has long been the preferred email service provider since its inception in 2004. Gmail powers over one billion messages per day and are one of the most trusted email clients out there. However, Gmail alone is not enough. To maximize your productivity and get more done in the day, there are various browser extensions available in the market that can help take your ‘Gmail game’ to a whole new level. Let’s take a look at some of the best Gmail plugins out there which will enhance your Gmail experience manifold! Have you ever noticed emails with memorable signatures at the end? The email instantly looked more professional, right? If you always wanted to have a cool looking signature at the end of each of your email, but you couldn’t figure out how to do it, today is your lucky day! WiseStamp, a Gmail plugin, allows you to do just that- create a signature at the end of your email. Using WiseStamp, you can create your custom signature, include your picture, phone number, social media links and much more. Make your emails stand out by using WiseStamp. It’s simple to use and quite effective. Did you know that 80% of sales require five follow-up attempts? Following up on an email is an extremely critical activity that can make or break your sale. Over 44% of salespeople give up after the first attempt. In other words, you just aren’t putting in the efforts to make the sale happen. As discussed earlier, an average professional is getting almost 121 emails a day. In such clutter, following-up becomes difficult. This is where FollowUp.cc comes in to save the day. FollowUp.cc is a chrome extension that seamlessly integrates with your Gmail account and helps you organize your follow-ups. Whenever you are sending an email, the extension reminds you to schedule a follow-up for the future. You can even snooze low-priority emails and focus completely on the things that matter the most. This Gmail plugin also allows you to auto follow-up on emails, track email opens and links, set recurring reminders and much more. You know how apps like Hootsuite and Buffer allow you to schedule your social media posts for a future date or time? Boomerang does exactly that, but for your emails. Boomerang is a Gmail plugin that allows you to write an email now and schedule it to be sent at a later date. Just click on the send later option and boomerang will remind you to send the email on the date/time you have set. One neat feature of Boomerang is the ability to, well, ‘Boomerang’ your emails. There are times when you want to read an email or a newsletter from your favorite publication but don’t have the time to read it just then. You can click the Boomerang button next to the email and set a date for it to appear again in your inbox. Boomerang will archive your email and bring it back to your inbox– at the time you have chosen- marked unread. Cool, right?! Have you ever wondered whether the sales pitch you sent to a prospect ever got opened? Or was it buried in their inbox; never to be seen again? Yesware, a useful Gmail plugin, gives you the ability to track your email after it is sent. You just need to click the “track” button next to the email and hit send. You can then easily track whether they have opened your email, clicked on your link, opened the attachment, etc. You can also create and save email templates to reuse later and test different subject lines. With the intelligent data you receive from Yesware, you can easily determine which template or subject line works best and up your email marketing game! Streak eliminates the need for investing in a CRM tool by converting your Gmail account into a sales machine. Take a look at the screenshot below. Amazing isn’t it?! Easy collaboration with teammates- you can share contact info, files, emails and much more. Easy installation, no coding required. Includes a mobile app that lets you work on the go. Export your data to Google Sheets. With so many cool features, Streak is definitely the tool every sales professional must have. A staggering 94% of businesses say personalization is critical to current and future success. When your messages are personalized and tailored to the receiver’s interests, the probability of success increases manifolds. This is true as relevant emails drive 18x more revenue than broadcast emails. The biggest roadblock in personalizing your marketing messages is the lack of information about the receiver. Rapportive, acquired by LinkedIn, sets out to do just that and more. Their “Sales Navigator” provides you personal information about a prospect, right in your Gmail. With Rapportive you can gather a prospect’s personal information like LinkedIn profile details, handles, their current job or the city they live in. This information is a dream come true for any marketer or sales professional, as it allows them to personalize communication by making use of this personal information. It also saves you time in searching for prospect information so you can focus on more important work. FullContact lets you manage all your contact information right from your inbox. You can see the complete profile of your contacts- their photo, job title, location and social media links. You can see their latest tweets to keep up with their activities. Quickly search your address book, add, delete or edit any contact right from your inbox. See information about the company they work at- it’s size, location, and social profiles. You can even collaborate with team members and quickly share contact information amongst each other. Ever try to schedule a meet-up with clients or prospects over Gmail? It’s a drag, isn’t it? More often than not, you and your client never settle on a date or time, which results in a long chain of back and forth emails. Assitant.to helps you solve this common problem easily. When the other party receives the email, they can confirm or make changes accordingly. Assistant.to continuously monitors your calendar activities and makes sure that there are no double bookings. It also automatically detects and converts your recipient’s time zone, so there’s no confusion. Assistant.to will also send notifications to both parties when an event is scheduled or rescheduled. ToutApp is one of the most advanced plugins in this list. It’s a paid plugin but comes with a 14-day trial period. ToutApp is made for sales and marketing teams to help them convert better. Track your email, websites, and documents. Book meetings easily by integrating your Outlook or Google calendar. Get detailed reports and insights of your campaigns. You can also integrate ToutApp with Salesforce, Outlook, Microsoft Exchange, and other CRM platforms. An average professional spends more than six hours in their inbox. As the business grows, email communications keep on increasing. This is a common problem that ActiveInbox attempts to solve. 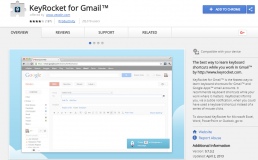 ActiveInbox converts your Gmail into an active task manager. It allows you to turn your emails into tasks with due dates and group them into projects. This way, you never forget to follow-up on an email as it protects it from getting buried in your inbox. ActiveInbox also allows you to track your emails, create follow-up replies and schedule emails for future dates. Using Bananatag, you can see whether the receiver has opened your email or clicked any link or attachment. Bananatag also provides you with easy to use email templates and scheduling features. You get data on when (time), where (location), and how (on which device) the receiver interacted with your message. Bananatag sends you instant notifications when the receiver has interacted with your email. You also receive real-time analytics on email opens, clicks, trends, and user behavior. It’s free to use and easy to set up. SecureGmail aims to protect your from intruders by keeping your emails encrypted. Only the receiver has the ability to decrypt the email using a previously agreed upon password. Even Google servers will only see the encrypted version of the text. Your emails are safe from rival companies, government, and worse-hackers. However, SecureGmail is only as good as your password. Make sure you and your partner have agreed upon a complex password that will not be easy to decode. Most genius ideas are actually really simple. GmailSnooze is no exception. 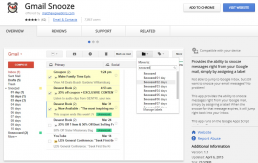 GmailSnooze lets you ‘snooze’ an email for it to appear at a later time in your inbox. Well, ask yourself this- how many times have you opened an email and thought about replying to the person but got sidetracked and forgot? With so much going on in our 24 hours, it’s easy to forget little things. With GmailSnooze, you can temporarily remove an email from your inbox and focus on more important matters at hand first. The email will then show up as a latest, unread message in your inbox after a day, week or whatever time period you have set. GmailSnooze is a brilliant way to de-clutter your inbox and prioritize tasks. Taskforce aims to keep your inbox to a minimum by converting your emails into to-dos. You can set due dates to your tasks, set reminders, assign to your teammates, and check them off one by one when they are completed. You can group your to-dos into folders to keep your email clutter free and share those folders with your colleagues, even if they don’t have TaskForce installed. A major reason why people spend an ungodly amount of time in their inbox is the plethora of subscription emails. Unroll.Me is one of our favorite Gmail plugins that shows all your subscriptions in one place and allows you to unsubscribe those you don’t want with just one-click. Unroll.me even allows you to group your favorite subscriptions into something they call a “Rollup.” The Rollup appears in your inbox once every day, at the time you have chosen. This significantly reduces inbox clutter and maximizes productivity. 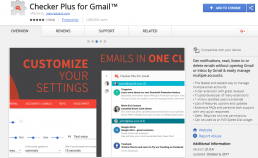 With over 1 million satisfied users worldwide, Checker Plus for Gmail is an excellent plugin to manage multiple Gmail accounts without ever opening up your inbox. Checker Plus for Gmail sends you push notifications (similar to Pushbullet for Android) and allows you to reply or delete the email there and then, without going to your Gmail account ever. Checker Plus also supports voice notifications. If you are busy at work or are cooking in the kitchen, the Chrome Extension also reads out your emails to you. How cool is that?! If you are all about productivity and speed, keyboard shortcuts can significantly reduce work time. Did you know that there are many keyboard shortcuts for Gmail can help reduce the time you spend in your inbox? Me neither! This is why KeyRocket exists- to teach you these shortcuts by annoying you with subtle notifications when you could have used a keyboard shortcut instead of a series of mouse clicks. KeyRocket also works for Microsoft Excel, Word, Powerpoint, or Outlook. Do you often end up spending more time in your inbox than you’d like? It’s hard not to, with so many subscription emails, newsletter content, client/partner/colleague emails, etc. it’s easy to lose track of time. 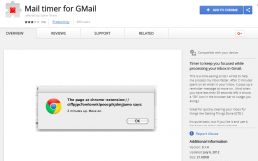 Mailtimer is the perfect Gmail Plugin for you. It is a time-saving script that pops up a notification telling you to “move on” to other work. The way it works is quite simple- you set up a reminder of say 2 minutes. After the end of 2 minutes, MailTimer shows you a notification saying that you have exceeded your stay in your inbox and advises you to move on. Mailtimer is the perfect extension that helps you stay focus on your tasks at hand. Ever wanted to email a company but didn’t know who to contact? Clearbit is a Gmail plugin that gives you that information right from your Gmail compose window. Just enter the company name and employee role and Clearbit will instantly give you information about who to email to and other personal details (if it finds any). You can also easily know who’s behind an email– their profile picture, social handles, company role, company size, funding, etc. without ever leaving your inbox. According to BatchedInbox, 38% of employees routinely check work email at the dinner table, 50% do so while still in bed, and 69% won’t even go to bed without first checking their email. We get it. Emails can be distracting. Especially when you are constantly getting new email notifications on your phone. BatchedInbox has a clever solution for your email distraction worries. BatchedInbox groups your emails into batches which you can choose to receive at specified times during the day. No more constant “pings” on your smartphone. If you still need to access your inbox right away, don’t worry. BatchedInbox offers real-time access when you need it. Gmail is a great platform for sending and receiving basic text messages, but what about newsletters? Over the years, clever marketers and large businesses have leaned on third-party email platforms like MailChimp, Active Campaign, Campaign Monitor, etc. to send out visually impressive email newsletters. In fact, 82% of B2B marketers use newsletters for content marketing. These third-party email platforms have been created with the idea to send bulk email newsletters. Most companies utilizing these platforms require a person or team dedicated to sending out bulk emails to get the full functionality out of the platform. In the end, these email tools work great when you have a combination of money, time and resources to devote. However, elink.io will help you out if you have none of the above! Elink.io is the fastest and easiest way to send Gmail newsletters. Elink.io allows anyone to send out the perfect, well-crafted and visually appealing newsletter in a matter of minutes! The tool works by turning web links automatically into visual content blocks (including a picture, title, and description), you can edit and add your commentary, add a header, publish and send to your Gmail account as an email draft. It’s the fastest way to create a professional looking email newsletter that looks like a lot of time and effort was placed in creating it. Little does your audience know that you created and sent it to them in a matter of minutes! Gmail has long been the king of emails, and for a good cause. It’s super easy to use, has an intuitive design, is reliable and secure. More often than not, we ignore how powerful it can really be. There’s way more than meets the eye with Gmail. It can easily supercharge your business and help you achieve more with less- or it can drag you down into the never-ending sea of emails. It is our responsibility to use Gmail to our advantage. These Gmail plugins will surely help you bring out the best of Gmail without tampering with your productivity and help you save a truckload of time. What Gmail plugin will you be trying? Are there any Gmail plugins you suggest that aren’t on this list? Comment below, we love hearing from you! I have heard about gmail plugins, I did used and sitll using boomerang up to now, its a great way to save us from our workloads, I would love to try other plugins as well, my door is always open for innovation. I would probably suggest boomerang for those beginners cause its super easy to use. Thank you so much for putting this together, there are a ton of great tips in this post. BatchedInbox is a lifesaver and more people need to use it. I really love the sound of Boomerang and how it could help me deal with the influx of emails that I receive! I want to try active inbox as well which might help! I honestly didn’t know there are plugins for Gmail! I’m literally on my email all day doing work when I could get a plugin to do it for me! ActiveInbox and Clearbit I definitely need in my life. I use wisestamp at the moment for my outlook but haven’t set it up for gmail yet. Bananatag sounds really good and it has a great name too! This is a really great list of all the gmail plugins. Thankyou for doing the research and sharing! I honestly never thought about adding plugins for my gmail account. I do this for my WordPress blog. Thanks for sharing. Wisestamp would be a great addition to all my emails. I think I’ll definitely add that one. But the one that i might like even more is that snooze option. There’s so many times I just think I’ll get back to an email and then will forget about it. That serves as a kind of reminder. So many good add-ons to choose from. Thank you for including some that are free. I need a few of these tools to clean up my every growing inbox. Thanks. Nice timing to come across this post. Thanks for the succinct and practical tips too! Loved the plugins especially checker plus! Thank the lord i found this post, i’ve been having problems with my plugins so this is super handy. I already have Wisestamp and love it. It was definitely worth the investment! I need to check out Unroll.me, though. I didn’t even know there were plug ins for GMAIL…though I probably should have, there seems to be something for everything now! I am definitely going to be checking some of these out – especially WiseStamp and Boomerang! I reall liked the idea of Boo.erang. In my field of work time is biggest issue. At least now I can schedule my work and send emails at those times which ia required. But my main question, does it work? about to download some new plugins, as the only one i was using was boomerang! I’ve never really thought too much about adding plugins to my site but this is always great information to have stored away in case I want to make changes toy site. This is an impressive list of email tools to use. I like Snooze and that’s about it. I use a few others seamlessly and doubt I want more. Great information to have handy. Boomerang is a favourite for me and it’s great for reminding me to follow up! I love that there is so many different options for Gmail! Thank you for your recommendation. Such a great list of email tools to use and very handy. Wow! I love this! I was just talking to a friend about this the other day, actually and just how I wished there was better formatting for my emails. Can’t wait to show her this. I’ll have to come back and check out bananatag and the others because there’s a lot of info here. I definitely need to check them all out! Great recommendations. Honestly, I haven’t heard gmail plugins like these. Now we can try using any of these. Thanks for sharing. Very good info..! lovely recommendation for gmail ! I don’t use any gmail plugins, I will check it out. This sure is an interesting post. Great article. Will add a few of these in for sure!